Knitting top-down patterns is a great way to familiarize yourself with what pattern shape best fits your body; one of the strengths of top down patterns is that you are able to try on the garment as you work it. In More Modern Top-Down Knitting: 24 Garments Based on Barbara G. Walker’s 12 Top-Down Templates, Kristina McGowan explores the world of top-down knitting. 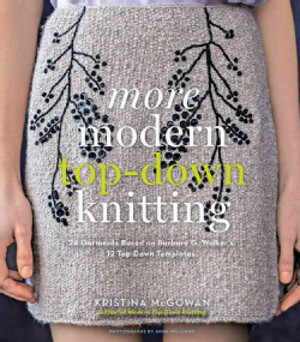 Packed with an engaging variety of knitting patterns, this book is a delight for knitters interested in becoming more familiar with top-down knitting patterns. Each pattern contains charts, extensive diagrams, and multiple color photos. The book is easy to read, and does a good job at giving knitters an up-close look at the more difficult details of each pattern. McGowan has created a collection of patterns that will be a pleasure to knit. McGowan’s sweaters are particularly impressive. Each sweater has a classic look, without over doing it on the design elements. There are patterns in More Modern Top-Down Knitting that will suit any knitter’s tastes and abilities. I liked that McGowan included patterns for relatively plain sweaters; it’s something you don’t often see, but it is a very practical move. I know I don’t want all of the sweaters in my wardrobe to be insanely cabled creations. Though sweaters are typically associated with top-down knitting, there are other garments you can knit in that fashion as well. McGowan includes fashionable patterns for hats, skirts, and even knitted pants. These patterns do a wonderful job at showing just how you can skillfully include knitted garments into your existing wardrobe. Every pattern would be at home in a day-to-day wardrobe.